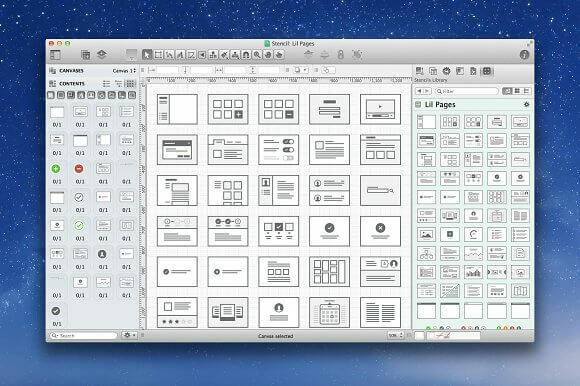 Lil Pages opens up the flexibility and enjoyment of creating beautiful documents to help communicate user flows, storyboarding, site map flowcharts, fast wireframing or simply UI icons to use in your next project. Lil Pages have been created to be simple, elegant and work straight out of the box. However, the real power lies in the flexibility of Lil Pages. Each of the 50 layouts comprises of basic shapes or strokes allowing for full customization. It's extremely easy to modify or create your own Lil Pages to create miniature pages of your website, iOS application or product. Included in Lil Pages: - 50 unique UI layouts - 5 browser layouts to use with your Lil Pages - Flowchart icons and arrows Lil Pages for OmniGraffle is built specially for OmniGraffle. It was rebuilt entirely within OmniGraffle 6 and contains every element seen in the original Lil Pages vector AI / EPS version. Like always, if you have any questions please don't hesitate to message us. Enjoy!